It’s not that “In Search of Excellence” was the first business book ever published – “My Life in Advertising”, “Confessions of an Advertising Man” and most of the works of Peter Drucker came well before it. But its appearance in January of 1982 radically changed business generally and publishing specifically, and coupled with the huge success two years later of Lee Iacocca’s eponymous memoir, it helped usher in an age in which businessmen were suddenly heroes and in which every executive with a moderately positive spreadsheet felt compelled to discuss it in mind-numbing detail. An age, it should be noted, in which we are still mired. Curiously, the book was something of a mistake, or at the very least, an afterthought. In 1977, McKinsey, where Peters and Waterman were consultants, had launched two major projects. One, focusing on Strategy, was the starchild, handled by the rocket scientists at the New York office. The other was focused on Organization – specifically structure and people – and was handled by Peters and Waterman. As is not unusual in business, the marquee project went bellyup while Peters travelled the world learning about “organizations”. Two years later McKinsey’s client Siemens requested a presentation of the findings in Germany, and then Pepsi wanted to see it in the U.S., and then, well the rest is history. Peters and Waterman arrived at their “examples of excellence” by polling McKinsey partners and others to find out who was doing great work, and ended up with a list of 75 companies that had shown consistent strong growth and profitability. This they eventually winnowed down to 43 from which they culled important lessons to be learned – or perhaps more accurately, qualities to emulate. Qualities which Peters and Waterman subsequently analyzed in separate dedicated chapters of the book. And those qualities were? 2) Stay close to the customer and learn from them. 3) Foster innovation and nurture ‘champions’. 4) Treat employees as a source of quality. 5) Show your commitment by being hands-on. 6) Stay with the business that you know. 8) Balance shop-floor autonomy with centralized values. Doesn’t look all that earth-shattering, does it? “Learn from your customers?” “Foster innovation?” “Treat your employees well?” One would think that these would be the kind of blatantly obvious maxims that any B-school student would be able to mouth at orientation. Did we really need a book to tell us this in 1982? Apparently so. In hindsight, “In Search of Excellence”, like most category-creating works, doesn’t fit neatly within the category it spawned – those boundaries were developed and refined by later emulators. Thus it is somewhat sprawling. Its thesis feels a bit tacked on at times. Its examples are not as locked down and vetted as one would expect from something by, say, Jim Collins. That last complaint has been a bit of an issue for Peters and Waterman in the thirty years since the book’s publication. There was a famously incendiary interview in “Fast Company” in which Peters allegedly admitted to “faking the data”, which was subsequently alleged to not have been Peters’s words but the interviewer’s. And then there was the question of the actual excellence of the 43 companies. “In Search of…” is as famous for its inclusion of Atari and Wang Labs (if you’re over 30 you know what a mistake that was; if you’re under 30, you should probably head to Google), as it is for its exclusion of GE. But to a certain extent that’s all old generals arguing about the last war. For the rest of us, the more important question is, is “In Search of Excellence” still relevant? And ultimately, the answer is yes. Because as fundamental as those eight qualities it trumpets are, who among us has not watched clients, agencies and bosses ignore and disregard them with predictably disastrous results? Or said another way, the fact that fire is hot is no less true simply because it is so mind-numbingly obvious. 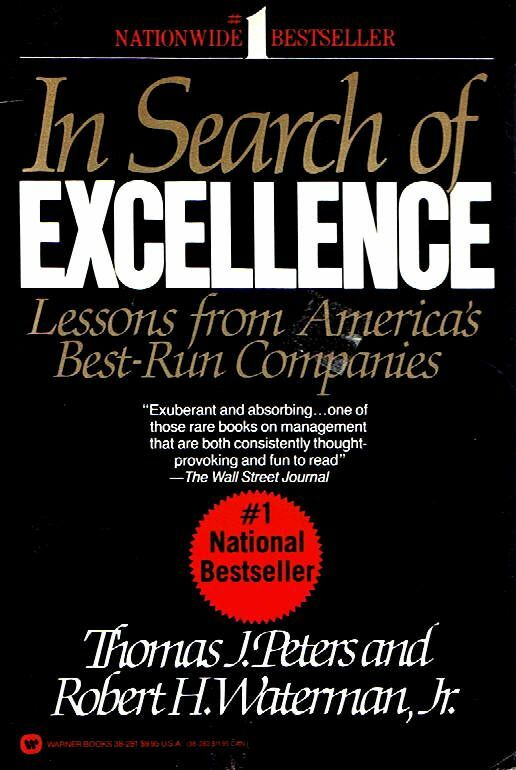 In Search of Excellence by Tom Peters and Robert Waterman was published by Harper & Row on 01/01/82 – order it from Amazon here or from Barnes & Noble here – or pick it up at your local bookseller (find one here).